In the early 1880s, it was felt a new St. Patrick's Church was something due the Irish Catholic faithful of Halifax's north end. After all, it was these Irish Catholics who had given so generously towards the building of St. Mary's Cathedral - on the site previously occupied by St. Peter's Church (including floating St. Peter's across the harbour to its new location in Dartmouth). The St. Patrick Church cornerstone was laid on August 8, 1883 by Archbishop Cornelius O'Brien, Halifax's first Canadian-born archbishop. The cornerstone contains copies of the constitution of the Charitable Irish Society of Halifax. Cornelius O'Brien took a very active role to hasten the new church along. He was also destined to become a key builder of Saint Mary's University. Funds for St. Patrick's came from merchants, labourers, professionals, the general public, and others. Those who could not give large amounts for the building gave 25 cents per month. Those who could not give a donation gave their time, so there was ample manpower at the construction site. In August, 1883, the Catholic ladies of Halifax held a Grand Bazaar on Spring Garden Road, next to the Court House. Over 10 days, 15,000 people visited the fair, and a profit of $17,000 was realized for the church building fund. The building had progressed so well that the Morning Herald of December 18, 1883 states: "Never during any previous building operation in the city, was so much accomplished in so short a time." This was due to three reasons: (1) The builder, Henry Peters, planned ahead and had materials on site when needed; (2) Archbishop Cornelius O'Brien visited the site every day, week in week out, to make sure the job got done; (3) The parishioners gave freely of their time, in whatever way they could, to see their new church take shape. The new St. Patrick's Church was officially opened December 22, 1885. The church building is 66 feet wide (some 15 feet wider than St. Mary's) and 175 feet deep. The granite work is all Nova Scotian stone, and the estimated cost to build the church by Mr. Peters was $60,000. 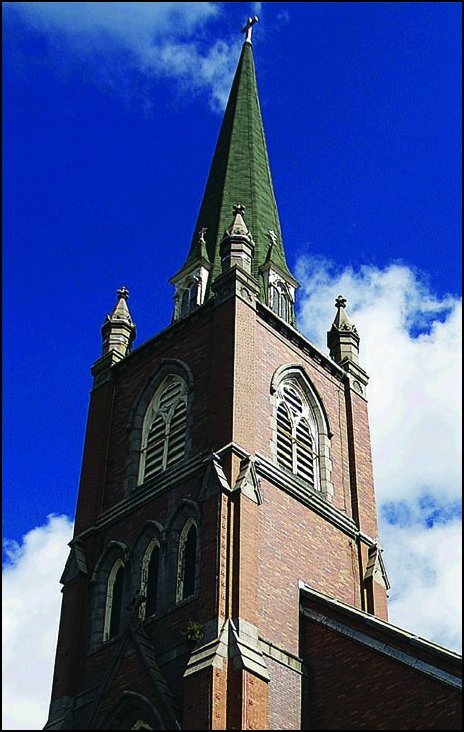 In his article, "Brunswick Street Gothic: Saint Patrick’s Church", Wallace Brannen writes: "[St. Patrick's] continues to serve as a beacon in its neighbourhood. The upward thrust of the centre spire is outstanding in the streetscape. The ratio of street level width to the top of the spire is roughly 1:2.5, not far off that of the High Gothic Amiens Cathedral at 1:3, and in dramatic contrast to the more earthbound churches of the English Gothic. Surely this tall and slender spire made it clear to Irish merchants and labourers alike exactly where God and Heaven were located…"
As Mr. Brannen commented, perhaps it was by the Grace of God that this impressive building, constructed by immigrant Irish craftsmen and volunteers, survived the great explosion of 1917. Completed during a progressive period when the parish church was the religious community's most valued possession, the richly decorated church building remains a remarkable intact example of numerous stylized highlights of French Gothic church architecture. 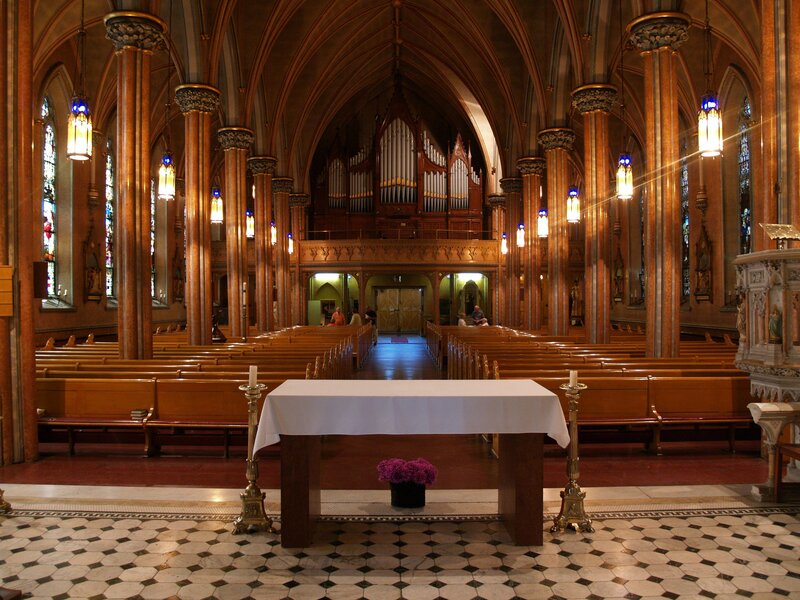 Inside St. Patrick's, all people can find artistic expressions of the great civilizing ideal of selfless detachment and spirituality, our belief that God may be approached through beauty, our feeling of compassion, our sense of unity with others, and much more. Perhaps this helps explain the outstanding contributions of the St. Patrick's community to the religious, educational, civic and business life of Halifax. St Patrick's Church is known for its continuing compassionate assistance to individuals facing the sometimes harsh realities of the world in the inner city. Its initiatives, for example, include establishing Saint Vincent de Paul's charities in 1867 and Hope Cottage in 1971. St. Patrick's Church, part of Nova Scotia's built heritage, continues to stand as a gracious symbol of personal faith as well as a powerful marker of community history and culture. For more information, read William Kelly's History of St. Patrick's Church, 1845-1984 (9.48 Mb).